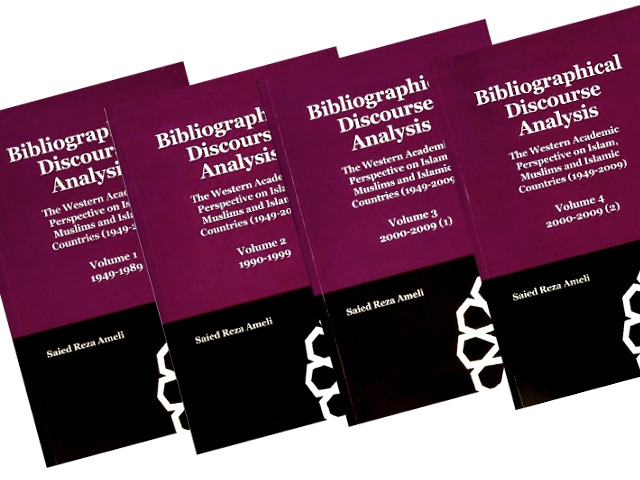 Saied Reza Ameli’s work Bibliographical Discourse Analysis: The Western Academic Perspective on Islam, Muslims and Islamic Countries (1949 – 2009) is a ground breaking critical analysis of Occidental Academic preoccupation with Islam and Muslims. These four volumes cover both the changes in interest within academia in what is being studied, to the change in view of Islam and Muslims as the subject of study. The work looks at articles, books, PhD and masters theses and dissertations that have been published over the past 60 years and that focus typically on the study of Islam or Muslims either globally or in a certain locality. As Ameli says, the study of Islam-West relations is of paramount importance for our understanding of the current status quo. The 21st century has seen an unprecedented rise in Western academic works on Muslims and Islam; highlighting a critical point in time that demands inspection. ‘Bibliographical Discourse Analysis’ reveals that 13.4% of works that were analysed bear the label of “Islamophobia”. His commanding analysis of such a vast period of history is as astute as it is detailed. His methodology, the changing trends and differing perspectives are all revealed within.